I have had one, yes ONE, good haircut in the 4 yrs since my friend and hairdresser moved out of state. One hairdresser I tried was halfway through cutting my hair when she confided she was legally blind. For REAL! I could not make this stuff up! I asked another stylist for a bob and walked away with a sterotypical short "mom" hair style. I instantly looked ten yrs older and much less-cuter for my husband. After that, I just trimmed the ends myself, avoiding trying to find a new stylist. Well, my friend (and hairdresser) moved back to little 'ol upstate NY and since my favorite way to wear my hair is in sort of 1940's styles I sent her a diagram of a long Middy cut from the era. It looked like gibberish to me but she is brilliant and deciphered it and modernized it a bit so I can wash and wear it. 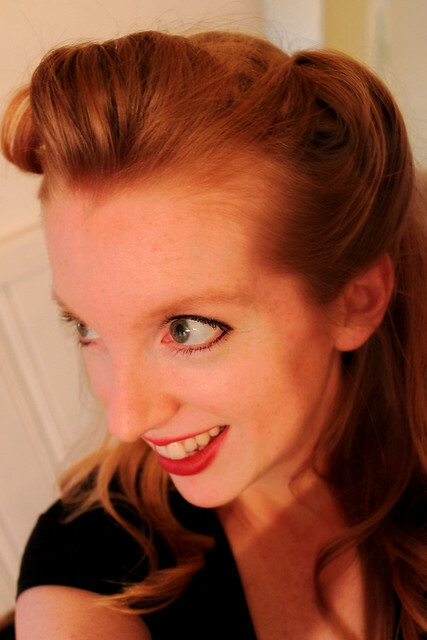 I've found that longer hair is so easy to care for and keep nice (than short hair, having had both lengths). My husband also prefers the more feminine looking-ness of length. My hairdresser had curled my hair but this little half updo took about two minutes with just a few bobby pins and keeps it out of my face all day. On busy days I quickly braid the rest of it into a side or back braid or a bun at the nape of my neck. Youtube has been a huge source of hair style inspiration for me. I don't consider doing my hair as vanity but see taking time to learn how to do my hair as a way to glorify God by looking presentable and look cute for my husband (and it just takes a few minutes, like I said). It's lovely! Yay for quick and pretty. It is very cute, and I do think we need to try to look our best for our husbands, but also to glorify the ONE who made us! Hannah, beautiful hair! 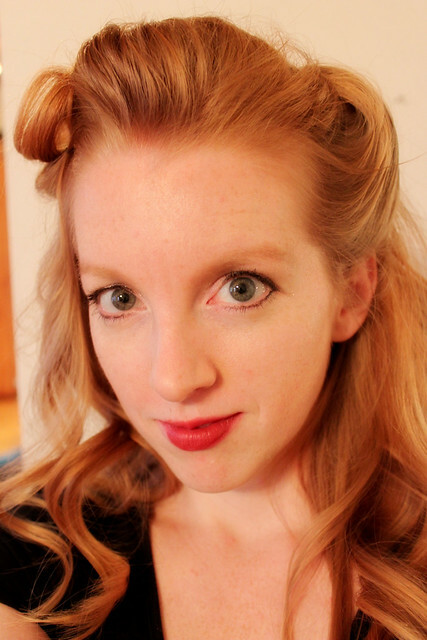 My daughter and I scoured the internet for 40's hairdo how-tos and never came up with much. I know you are busy, but would you have a few links to particularly good video clips or tutorials that have helped you? Would love to wear my hair that way more, too. It's so cute and feminine. Oh, how lovely! It definitely suits you! I also have long hair and find it easy to maintain -I just wash and wear also. 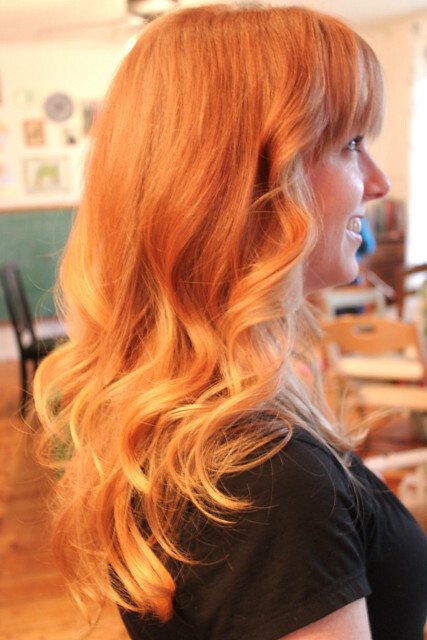 If you have a chance I would love to have you share some fast and easy daily hairstyles! I only do a ponytail or wear it down since I don't know how to style it. Gorgeous. I love the vintage hairstyles. I love your cut and it seems very easy peasy. Who has time for a DAILY blow dry, iron, curl, product, etc. I barely brush mine now that I have children - they take priority. Fortunately and unfortunately I live on a tropical island and have a super thick wool blanket on my head or I'd wear mine down in a manner similar to yours. I think our hair doesn't define us but it is a nice God-given accessory to use as a gift for our husbands to look upon a semi-kept wifey. I can't imagine what must go through my husband's mind when he comes home from a long day and sees me with my rats nest in a bun on the top of my head like an old school marm with the days poo, spit up and who knows what else along with the day's hard labor adding up to some serious BO. I am sure I'm not the only one that has days like this but seeing moms of many take the time and effort to look nice gives me a little motivation to do the same occasionally! Your new haircut is gorgeous! Have you tried the sock bun method to curl your hair? You should look it up on youtube. Pretty interesting. I showed it to my daughter in law...who is living off grid. Perfect solution, I think.